The eco-conscious folks that brought us bioDOGradable dog bags, have now provided home gardeners with a source of rich, organic fertilizer from their own food and pet waste! It can process 5 lbs of food or pet waste per day and it takes only 2 weeks for fresh compost to be produced! Made entirely from recycled and recyclable materials. Electro mechanical-Energy star 110v indoor/outdoor composter-turns "doodoo"(Kitchen waste too) to dirt in 2 weeks! 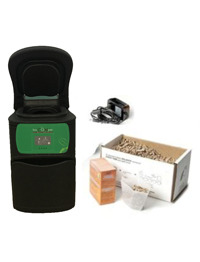 The BIOCOMPET, first ever electric indoor or outdoor home pet waste and organic waste composter. Kills 99.9% of pathogens in 24 hours for use in any type of garden.